How Morocco pushed me out of my comfort zone. How Morocco Pushed Me Out of My Comfort Zone into a New Awareness. Inside our Riad, we created our haven, complete with rooftop sunset sessions, game nights around the fireplace and engaging conversations about life and newly forming businesses. We would connect with others in our group daily for lunches, sightseeing or organized yoga sessions at the community Riad which was across town. Getting to this Riad meant learning our way through the maze of vendors in the Medina — enter by taking a left at the man selling pipes, continue along the row of spices and teas, take a slight left past the leather goods and a quick right at the corner spice shop. Once you pass the row of carpets, take a left towards the men selling pieces of leather and a slight right towards the row of Hammams. Once you hit the end and the man trying to sell you food, take a right and then a left at the “internet here” sign and the Riad will be on your left. If you’ve hit the restaurant we went to on the first night, you’ve gone too far. We’d test each other to see who could remember the way without relying on the blue dot on Google Maps and even more impressive, who could do it in reverse to get home. The sights and sounds filled our senses, and I delighted in the newness of it all. I expected to be hassled a bit, selling things in the Medina is their business, and I was after all a tourist and their intended customer. Looking back, I also expected (naively) that after some time, I’d be hassled less and be able just to wave as I walked by as this would be my route multiple times a day, week after week. In our months spent in Spain and Portugal, it didn’t take long for the local vendors and restauranteurs to get used to us and give us a little wave, ask about our day. 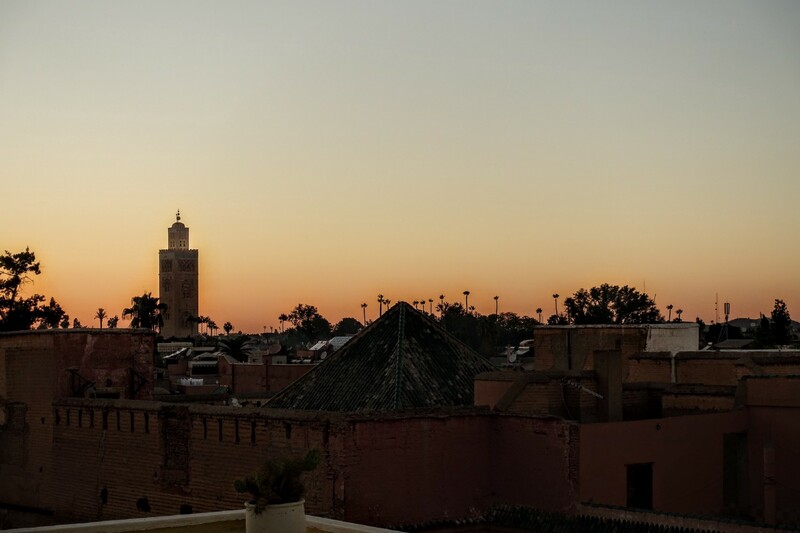 We quickly became part of the community, and I expected Marrakech to be no different. As the days turned to weeks, what was once an exhilarating experience was quickly wearing me down. The verbal invitations to buy their products was now coupled with physical contact — grabbing my hand to try and bring me into their store, holding my shoulder to direct me to their products day after day. With vendors side-by-side for miles, I was on constant alert not knowing who would reach out and when. I tried many approaches, smiling and nodding no, looking at the ground and confidently walking before they had a chance to make eye contact which led to eventually covering my blonde hair, wearing baggy clothes, often with a hood up. Walking the Medina in this way saved me at least 10 minutes each direction as I was getting stopped and grabbed less and therefore became my preferred method, especially when I was in a rush to get to yoga or meet up with friends on the other side. I began to see my energy deplete. I was coming home exhausted, wanting to hide away in my room which felt like the only place in the city that I could be alone for even just a few minutes. I wasn’t writing, I wasn’t sharing, I was simply trying my best just to be. I started to wonder what had changed so drastically between being high-on-life in Spain just weeks before to now feeling so lost and drained. I realized that each day before stepping outside of my Riad, I was mentally preparing and putting energy into simple things that I never had to think of before. I had never thought twice about stepping outside of my door or walking down the street in all of the areas that I’ve lived previously. I had never had to think about my clothing in a way that I was now considering what could draw me the least attention to quickly and safely get me from A to B. I had never had to cover my hair or hide my smile and friendly personality to fend off continual unwanted advances. I was in an extended defense mode, protection mode, for the first time in my entire life. Of course, I had gone through fleeting moments of fear, the thought that someone might be following me or walking down a dark alley alone, but that was a different feeling, a feeling that passed quickly and I knew would soon be over. This fear was subtle, but without an end in sight that didn’t involve getting on an airplane. At that moment, I received a glimpse of my privilege, and my heart opened to the millions of people around the world that operate, perhaps unknowingly, in a similar environment every, single day. My mindset immediately switched from one of selfishness to one of empathy. Here I was focusing on why I wasn’t shining as bright and living my highest potential after feeling an energy shift throughout a few weeks when others have lived their entire lives in continual defense mode and led beautiful lives despite it. I received a glimpse of what it must be like to walk down a street where you aren’t accepted by those around you, where you aren’t considered “one of them” and therefore feel uneasy and perhaps in danger, when people don’t care to understand who you are because of what you may look like. Not just around the world, but in cities all across the United States as judgment is passed, specifically when it comes to race and gender. Individuals that have to worry about something as basic as their wellbeing, who exert energy into simply existing in the world outside their walls every single day, have a hurdle to personal happiness and success that I had previously been blind to. That hurdle had never been in my path before, and while I heard it existed for others and thought I understood, I was wrong. Morocco pushed me out of my comfort zone, but it forced me into a larger awareness of the world around me and provided me a glimpse of my privileged place within it. I say glimpse because my experience was temporary, it was a peek into a world I will never truly know like those that live it. I have a new respect for those who continue to fly over hurdles, a yearning to understand more about the obstacles I have yet to discover and a passion for removing them whenever possible.